Underground Cellar Giveaway | A Savings WOW! 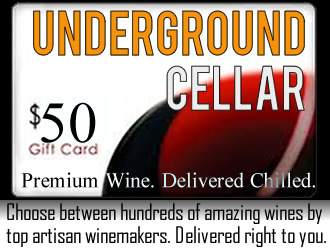 Grand Prize: A $50 Underground Cellar gift card for you and one to give to a friend! Underground Cellar is the most exciting way for you to buy amazing wines online from your favorite wineries at the lowest price. Through the Underground Cellar community of wine lovers, members interact directly with prestigious vintners and aficionados, get access to private stashes of small-production wines from high-end wineries and receive free upgrades on wine purchases. Better yet, members can store their wine in their very own temperature-controlled state-of-the-art Wine Cellar In The Clouds, for as long as they’d like (for free! forever!). If you love wine and want unprecedented access to excellent wine at great prices, jump on the bandwagon for free at Underground Cellar to start reaping the benefits. And don’t miss out on the mayhem-filled Underground Cellar launch party September 12th, at Fort Mason in San Francisco, CA, where you can meet the team, drink amazing wine, and win awesome prizes! Learn more at MysteryWineNight.com.